Biarritz ([bjaʁits]; Basque: Biarritz [biarits̻] or Miarritze [miarits̻e]; Gascon Occitan: Biàrritz [ˈbjarits]) is a city on the Bay of Biscay, on the Atlantic coast in the Pyrénées-Atlantiques department in the French Basque Country in southwestern France. It is located 35 kilometres (22 mi) from the border with Spain. It is a luxurious seaside tourist destination known for the Hôtel du Palais (originally built for the Empress Eugénie circa 1855), its casinos and its surfing culture. Biarritz is located in the Pyrénées-Atlantiques department in the Nouvelle-Aquitaine region. 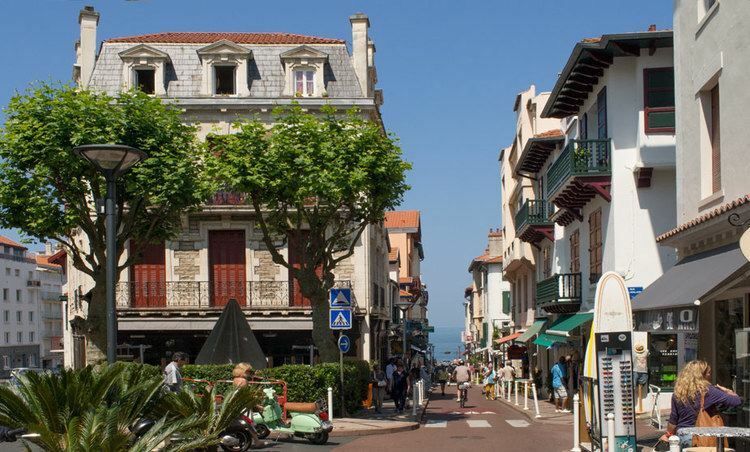 It is adjacent to Bayonne and Anglet and 35 kilometres (22 mi) from the border with Spain. It is in the traditional province of Labourd in the French Basque Country. In Basque, its name is Biarritz or Miarritze. Its current Occitan Gascon name is Biàrrits. The name for an inhabitant is Biarrot; Biarriztar ou Miarriztar in Basque. The suffix -itz (cp. Isturitz) is a Basque locative. The name appears as Bearriz in 1170, Bearids in 1186, and Bearritz in 1249. Biarritz appears as Bearids and Bearriz in 1150, Beiarridz in 1165, Bearriz and Beariz in 1170, Bearidz (1186), Bearriz and Beariz (12th century), lo port de Beiarriz and Bearridz in 1261, (cartulaire de Bayonne). Other forms include Beiarid (1199), Bearritz (1249), Beiarriz and Beiarrids (1261), Bearridz (1281), Bearrits (1338), (rôles gascons), Bearritz (1498, chapitre de Bayonne38), Sanctus Martinus de Biarriz (1689, collations du diocèse de Bayonne39), mearritcen (1712), Biarrits (1863, dictionnaire topographique Béarn-Pays basque) et Biarritze et Miarritze au XIXe siècleNote 10. Analysis of stones from the Middle Paleolithic show that the Biarritz area was inhabited at that time. The oldest mention appears in a cartulary, Baiona’s Golden book, from 1186, where it is named Bearids; some years later the name used was Beiarrids. The first urban town was to the south, at the top and at the interior, where the church of San Martin is located. This church is the oldest in Biarritz. In 1152, Eleanor of Aquitaine married Henry II of England, who became suzerain of the Duchy of Aquitaine. Prince Edward, oldest son of Henry III of England, was invested with the duchy, and betrothed to Eleanor of Castile, who brought him rights over Gascony. On the other hand, the château of Belay (first mentioned in 1342), also called château de Ferragus, protected the coast and the current Port-Vieux (old port), while religious life and community assemblies took place at Notre-Dame-de-Pitié (a chapel mentioned in 1498), dominating the Port-des-Pêcheurs, or fishing port. A document dated May 26, 1342 attested to this fishing activity, authorising les Biarrots to "(…) remit to Bayonne all the fresh fish that we and succeeding inhabitantsof Biarritz can fish from the salt sea". Construction of the château de Ferragus was decided by the English, on the foundations of a Roman work, at the summit of the promontory overlooking the sea, named Atalaye, used as a whale-observation post. This château had a double crenulated wall two meters thick, a drawbridge and four towers. Mentions of this château occur as late as 1603, in the letters patent of Henry IV. One tower remained as of 1739, when a daymark was established there, called de la Haille, then de la Humade. The tower disappeared in 1856. Most of the documents, records and official agreements gathered in the archives from Biarritz mention whaling. This was the principal local industry. Consequently, the town's coat of arms features the image of a whale below a rowing boat manned by five sailors wearing berets, one of whom is preparing to throw a harpoon. This inscription is written on it: Aura, sidus, mare, adjuvant me (The air, the stars and the seas are helping me). Biarritz has long made its living from the sea: from the 12th century onwards, it was a whaling town. In the 18th century, doctors claimed that the ocean at Biarritz had therapeutic properties, inspiring patients to make pilgrimages to the beach for alleged cures for their ailments. After the 7th century, Biarritz had many confrontations with Baiona, with the Kingdom of England – Lapurdi was under its control – and with the Bishop of Baiona. Almost all of the disputes were about whale hunting. In 1284, the town's right to hunt whales was reinstated by the authorities of Lapurdi and the Duchy of Aquitaine. From the Middle Ages and Early modern period a watchtower has looked down over the sea at Biarritz, from “La Humade”, waiting for the sight of a whale. Whenever those keeping watch saw a whale, they would burn wet straw, to create a large amount of smoke and thus communicate the news to their fellow countrymen. Eventually, however, the tower disappeared. In the 16th century, as a consequence of the attacks suffered in this area, or for other reasons, the whales migrated to other places. Whale hunters from Lapurdi therefore crossed the Atlantic Ocean in pursuit of them, and they spent some time in the Labrador Peninsula and in Newfoundland (island). Later, instead of hunting whales, they started cod fishing in Newfoundland. A century later, due to the ban on fishing off the coasts of America and the steely competence of English and Dutch fishermen, the number of fishing boats from Biarritz diminished and nowadays, the Biarritz fishing industry in these areas has come to an end. Even though the population from Biarritz was originally Basque, it is hard to assert whether the main language of the village was Basque or French. The first lighthouse of the village was built in 1650. Biarritz was an independent municipality, until 1784, a clergyman, four sworn and the city was governed by twelve deputies. Deputies were democratically chosen: there were four neighbourhoods (Portua, Bustingorri, Hurlaga and Alto), and three deputies has to be chosen from each of them. However, deputies were chosen by the abbot and sworn. Since they had no Town House, they gathered in a ward near the church. As they did not have place for all the attending people, they made their meetings in the cemetery. 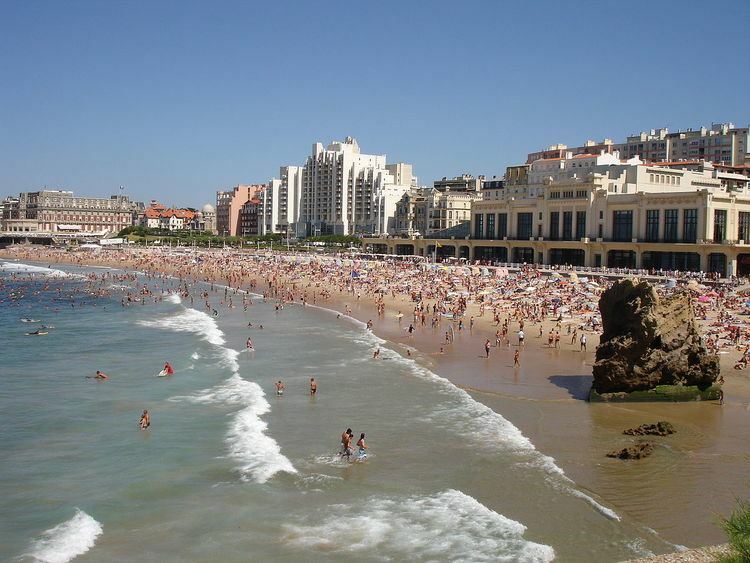 That time, Biarritz was composed of around 1,700 citizens. In the mid-18th century, the city began to change into a worldwide known bath-city. From 1784 onwards, after the French Revolution, taking a bath at the sea was no longer a behaviour of those who were fools; sea-baths were fashionable. In 1808, Napoleon himself broke prejudices and took a bath on the Basque Country’s coastal water. 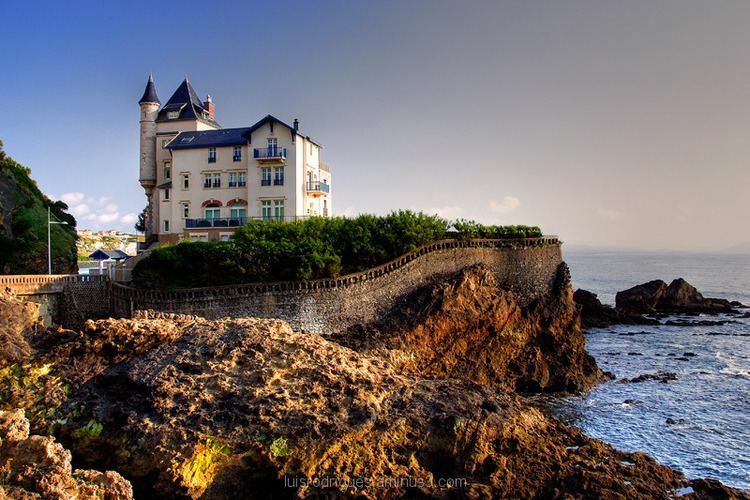 In 1840, the Town House or Municipality of Biarritz started to organize an initiative in order to promote and attract those who loved most the sea. Either for good or for bad, Victor Hugo’s prophecy was fulfilled. Biarritz planted poplars, tamarinds, hydrangeas, roses and pitosforuses on the slopes and the hills, set railings on the dunes, covered moats with elegant stairs… and polluted with the speculation of the land and the money-hunger. Humble and proud tourists praise Biarritz’s coast, from the beach at the limit of Bidarte (Plage des Basques), to the cape of San Martin. There it can be found a white lighthouse 44 metres (144 feet) tall, built in 1834 replacing the one Louis XIV ordered to build. Various hotels were made, as well as a municipal casino, the club Belleuve and the casino were opened in 1857, the thalassotherapy house, and wonderful luxury houses. Luxurious store shops from London and Paris were also set up in Biarritz, and 36 small newspapers were published in the village. Biarritz became more renowned in 1854 when Empress Eugenie (the wife of Napoleon III) built a palace on the beach (now the Hôtel du Palais). European royalty, including British monarchs Queen Victoria and King Edward VII (who caused a minor scandal when he called H. H. Asquith to kiss hands at Biarritz in 1908 rather than return to London for the purpose), and the Spanish king Alfonso XIII, were frequent visitors. Biarritz's casino (opened 10 August 1901) and beaches make the town a notable tourist centre for Europeans and East Coast North Americans. The city has also become a prime destination for surfers from around the world, developing a nightlife and surf-based culture. Originally, there were two settlement sites: the neighbourhood that was around the church of San Martin, and the fishing-port defended by Belay or Ferragus Castle. The coat of arms was a whaler, which was a symbol of the town. Opened in June 1893, Biarritz’s salt-baths were designed and built by the architect Lagarde. From the gatzagas of Beskoitz and after passing through a 20-kilometre (12 mi) pipe, water ten times saltier than the sea was used. The baths were closed in 1953 and demolished in 1968. The presence of French Republic’s authorities and the fact of having launched the Paris-Henday train, led Biarritz to become one of the most outstanding tourist areas all over Europe. The queen of the beaches became the beach of the kings: Oskar II from Sweden, Leopoldo from Belgium, tireless traveller, the empress of Russia, Nikolas II’s mother, Elisabeth from Austria, Natalia from Serbia, and her ill son Alexandro, Jurgi V from England, Eduardo VII and England’s Queen Victoria, Alfonso XIII from Spain, aristocrats, rich people, actors, from Europe and South America… In the summer-time, high-status people gathered in Biarritz. Therefore, the number of population remarkably increased, from 5,000 to 18,000. At the end of the 19th century, 50,000 vacationers were gathering in Biarritz. The big store named Biarritz Bonheur, created in 1894, enlarged twice (in 1911 and 1926), and still operating, became the temple of luxury and fashion. At the start of the 20th century, most of its workers spoke in English. At the end of World War II in Europe, the U.S. Army's Information and Educational Branch was ordered to establish an overseas university campus for demobilized American service men and women in the French resort town of Biarritz. Under General Samuel L. McCroskey, the hotels and casinos of Biarritz were converted into quarters, labs, and class spaces for U.S. service personnel. The University opened 10 August 1945 and about 10,000 students attended an eight-week term. This campus was set up to provide a transition between army life and subsequent attendance at a university in the USA, so students attended for just one term. After three successful terms, the G.I. University closed in March 1946 (see G. I. American Universities). St-Martin's Church, constructed in the 12th century, restored in the mid-16th century. Biarritz has a temperate oceanic climate, Cfb in the Köppen climate classification. Dassault Aviation, manufacturer of fuselage for Falcon planes. Surfing in Biarritz is of a world-class standard and first appeared in 1957. The town has a strong surfing culture, and is known worldwide for its surfing scene and the competitions it hosts yearly, including the Quiksilver/Roxy Jam tournament. In July 2011, Biarritz also hosted the Roxy Pro event, a tournament part of the ASP Women's World Tour. The town is home to a prominent rugby union club, Biarritz Olympique. Basque pelota is a very popular sport of the Basque country. Several local and international competitions take place in Biarritz. The golf course near the lighthouse (Le Phare) was created in 1888 by British residents. In addition, the town has a large circular golf range area on the border with illbaritz. The city has two public schools (Villa Fal and Jean Rostand) and one private (Immaculée-Conception). Malraux High Schools is the only one in Biarritz. There is also a tourism high school in the border of the Western neighborhood of La Négresse. Biarritz is easily accessible from Paris by France's high-speed train, the TGV, and more regionally from Bordeaux, by TGV or TER. Trains are also available to travel east towards Nice. Night trains regularly depart from Irun, south of Biarritz and pass through the city before heading to Paris during an overnight trip. Many tourists and regulars to the city have begun using the night train to take weekend trips to Biarritz and saving travel time by traveling at night. The Biarritz – Anglet – Bayonne Airport is located about four kilometres (2.5 miles) from the city. It is near N10 road towards Anglet and is served by airlines from France, the United Kingdom, Spain, Ireland and Germany. Eugénie de Montijo (1826–1920), the wife of Napoléon III, built the villa Eugénie, today the Hôtel du Palais. Aaron Bank (1902–2004), World War II Office of Strategic Services (OSS) agent and co-founder of the U.S. Army's Special Forces Group (later, Green Berets), was a lifeguard and medical (physical) therapist's aide at Biarritz before he enlisted in the army in the late 1930s. 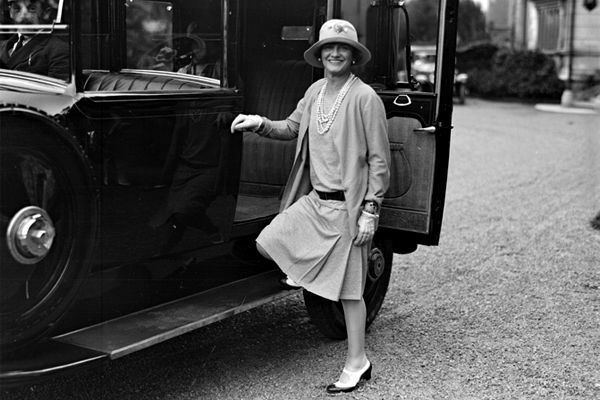 Aimée de Heeren, born Soto-Maior de Sá (1903–2006) mistress of President Getúlio Vargas, owned the villa La Roseraie, 12 rue Martias, where she spent summers for half a century, receiving kings, heads of state, and many famous guests. Pablo de Sarasate (10 March 1844 – 20 September 1908), who was a well known Romantic Era Spanish composer born in Pamplona, Spain, died in this city. In 1959, Cadillac Motor Car introduced an upper level trim variant of its Eldorado model, marketed as the Eldorado Biarritz, which remained in production through 1985. The major festivities are celebrated in November 11, for Saint Martin. That day, the new gentleman of the Confrérie de l’Operne de Biarritz are proclaimed. Barnacle is their logotype and people who work in favor of ecology are chosen Since Biarritz is a city based in tourism, there are acts during the whole summer, such as pelota festivity, equestrian competition, concerts and recitals, folklore festivals, water acrobatic ski, sea trips, performances, rugby competitions, bullfights and night parties.